for better interaction with Google and better management of your own site, but have you ever noticed the "Message center" at the upper right corner of the dashboard? Since its launch in July 2007, Message center has become a more and more important channel for Google to communicate with webmasters regarding your Webmaster Tools account and the sites you manage. To help you have a better idea of what the Message center is, here I'd like to introduce more about it. What kind of messages could webmasters get from Message center? 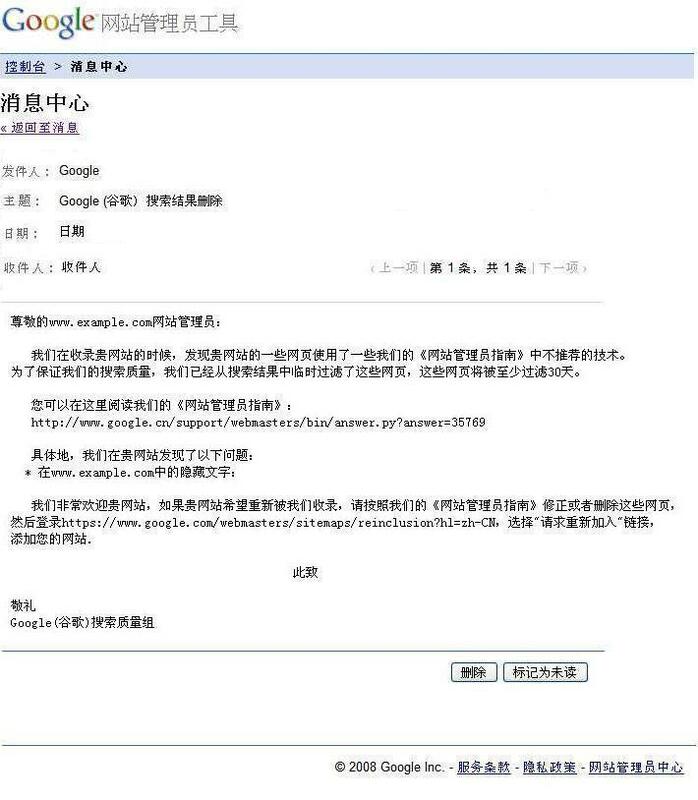 Currently you may receive the following kinds of message from Google, which may remind you in time and help you solve some problems regarding the sites you own. Over time we'll use the Message center as a communication channel for more types of information. "Infinite space " is a frequent problem that Googlebot faces when it crawls the web. Lots of dynamically generated links with little or no unique content consume the bandwidth and may prevent Googlebot from completely indexing the real content on your site. Google recently started notifying site owners if you have some "infinite space" problem or other problems related to crawling. Register with Webmaster Tools and check Message center, you'll know if Google has notified you of this or any other problems while crawling your sites. What's more, you could also find sample URLs for the potential problem attached in the message, which might be helpful for your troubleshooting. For more information, you could also refer to this article in Webmaster Help Center . 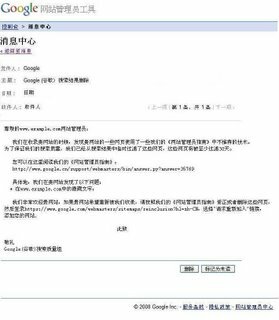 From our previous post about requesting reconsideration using Google Webmaster Tools, you may have an idea when and how to file a reconsideration request to Google. Once you've submitted a request, you'll find a message from Google in the Message center confirming that we've received it. We'll then review your site for compliance with the webmaster guidelines. Before filing a reconsideration request, don't forget to double check whether your site is inline with webmaster guidelines or not. What should I do if I didn't get registered with Google Webmaster Tools before and possibly miss any message that Google sent to me? Don't worry. Since March 2008, Message center began to support "message waiting" feature for future owners who haven't previously registered with Google Webmaster Tools. Messages sent after the launch of this feature can now be retrieved for one year and will remain in your account. As soon as you verify your ownership of the site, you'll be able to access the messages (if there is any) even if they were sent before you get registered. Creating a Webmaster Tools account and verifying your site gives you access to any message from Google and better communication with Google. So why not claim your site in Webmaster Tools right now so that we might give you a heads-up of some issues that we see? Should you have any questions, a great place to look for help is our Webmaster Help Group. Meanwhile, your feedback and suggestions for Message center would be very much appreciated. You may have tried our Webmaster Tools for better interaction with Google and better management of your own site, but have you ever noticed the "Message center" at the upper right corner of the dashboard? Since its launch in July 2007, Message center has become a more and more important channel for Google to communicate with webmasters regarding your Webmaster Tools account and the sites you manage. To help you have a better idea of what the Message center is, here I'd like to introduce more about it.